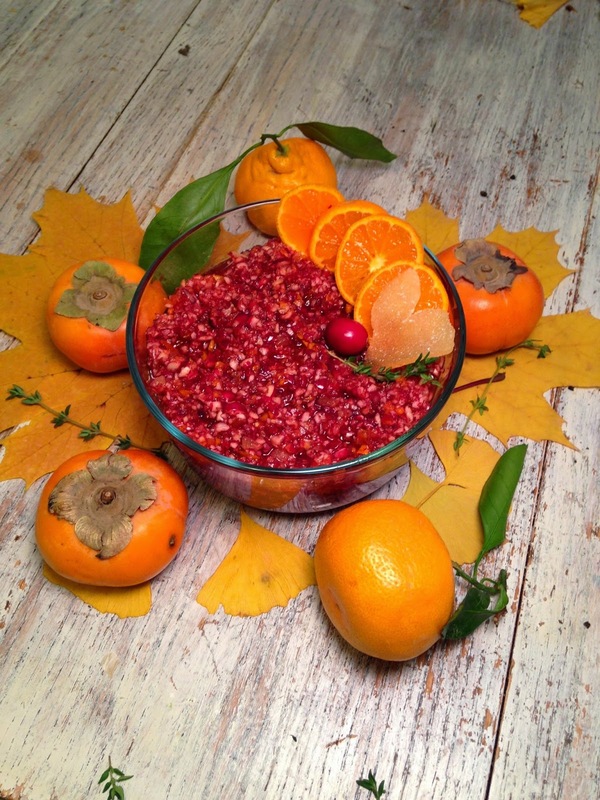 Below you will find the recipe for this tart, yet sweet Cranberry Relish. First, of course, I have shared some Thanksgiving memories and thoughts. Also given a few tips on the brining process for the Turkey. Thanksgiving! Does it amaze anyone else that the end of November crept up so quickly? And we all know that from now until January 1st will zip by more quickly than you can bat an eye. This year will be my fourth Thanksgiving spent with family, after many years of absence from the Thanksgiving table, while I was on a quest to experience the world. Thanksgiving has created many memories. Growing up in Anson, in the early primary years, our small elementary school classes would have a Thanksgiving feast each year. We each brought in a dish to share, and I think would even dress up like a Pilgrim or an "Indian". In Maine, community Thanksgiving feast, meant moose venison stew and Indian pudding. I remember the excitement of getting to leave school early for the 5 hour drive to my grandparents house in South Windsor, Connecticut. We would have a very traditional Thanksgiving. I remember how the food would get packed up so quickly, there was no chance for picking or evening grazing. Sometimes on the weekends we would head into Manhattan to visit my other Grandmother. This was even more exciting. The hustle, bustle and stimulation of New York was my favorite thing in the world. I loved visiting 6th and 5th avenue and seeing all the Christmas window scenes with my Jewish Grandma at Macy's and the other stores. New York City was my favorite place on earth. I think that is where my love of different foods began. When I got older, and my Dad's parents had passed, my aunt took over Thanksgiving in Vermont. Her husband was an archeologist, which of course, I wanted to be. His artifacts were so fascinating to me. In my teen years, I kind of stopped participating in Thanksgiving for a couple years. The year of my 17th Birthday, which must have been my senior year, my friend Mary and I took a bus to the city. What a luxury staying at my Grandmother's West Village apartment, alone. We spent the morning working in a Shelter, handing out meals to the homeless. An old Vietnam Vet, who was very charmed by me, or perhaps me by him, still sticks in my mind to this day. The rest of the afternoon was not what you might expect from two 17 year old girls alone in New York City. We didn't spend the evening trying to sneak into bars or buying alcohol, but instead made a box of Stovetop Stuffing, opened a can of Ocean Spray Cranberry Sauce and both fell asleep on the couch watching TV. And here we are, fast forward about 15 years and I'm the one who has found the love in exploring new recipes, and taking on the turkey. There are days when I feel heavy and weighted with all the tasks and responsibilities that I must carry out. It can seem so overwhelming, and some of them can seem and can be downright defeating. Sometimes it feels like I am just treading water, in this whirlpool of things swirling around me. It could be easy to get caught in that trap, of self pity, resentment, self doubt. But when I let myself slow down, and really look at what I have in my life, and the fact that I keep afloat, with a positive attitude and keep pushing forward, I remember how much I have to be thankful for. I know each of our own experience is relative, but when I listen to the news, hear personal stories from friends and colleagues, or family situations of the children I work with, there is no room to let those heavy things pull me down. 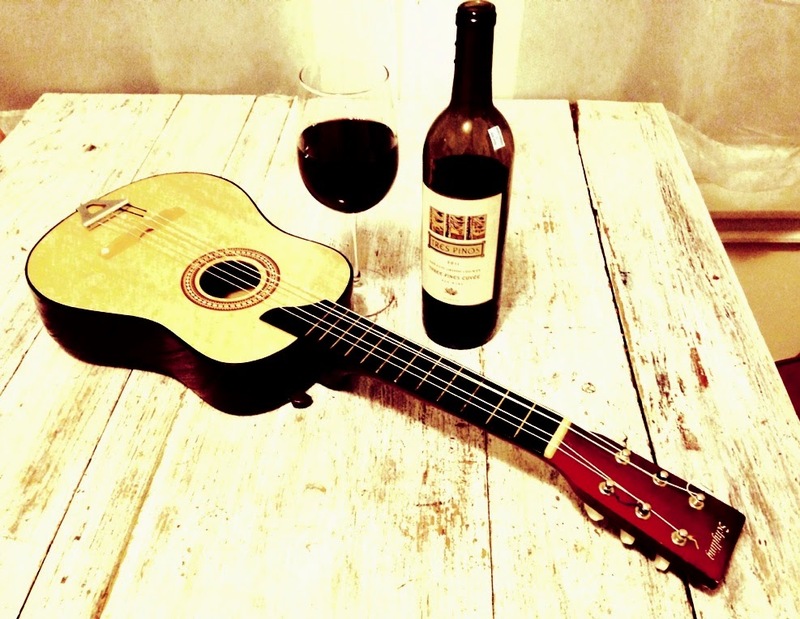 So take some time to slow down, amidst the rush of the holiday season. The travel, shopping, cooking, preparing the house for guests. Stop for a minute, reflect on those memories you have of your Nana who passed on the trinket you are dusting. Wake up early and go to your favorite spot to watch a sunrise. 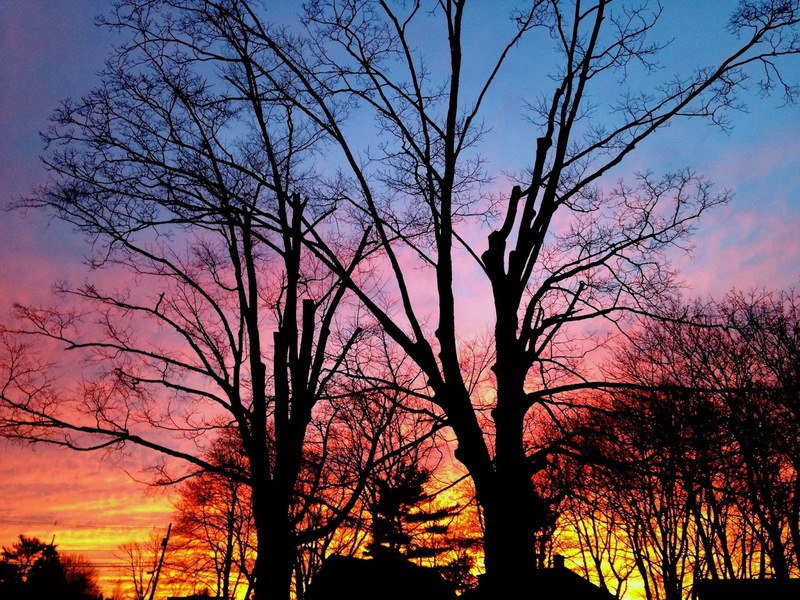 Enjoy the soft pastel hues that awaken the earth, or the vibrant pinks and reds that tell you the weather is changing. Inhale the earthy smell of the decomposing leaves, that will feed mother earth, the same way she fed them. Tell someone how much you appreciate them and why. Thank yourself, for providing a loving, safe home for your children; putting in that extra time and work at your job; studying hard to get that grade that might have seemed out of reach; the work you do in your community; making someone laugh or smile. Create your own list of thanks. Its really something we should do on a weekly if not daily basis, slow down, breath deeply and give gratitude. 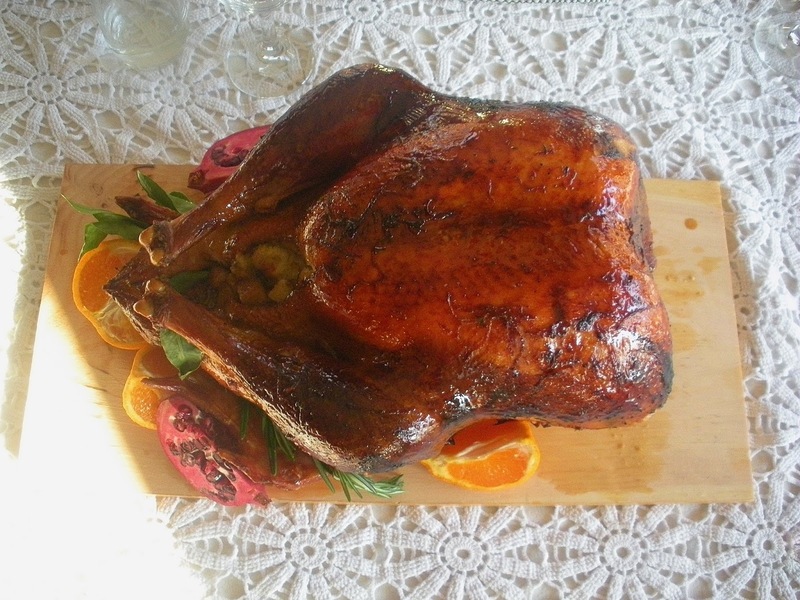 I've made some tweaks to the Turkey blog. I've added some more tasty ingredients to the brine. I was off to such a good start today. 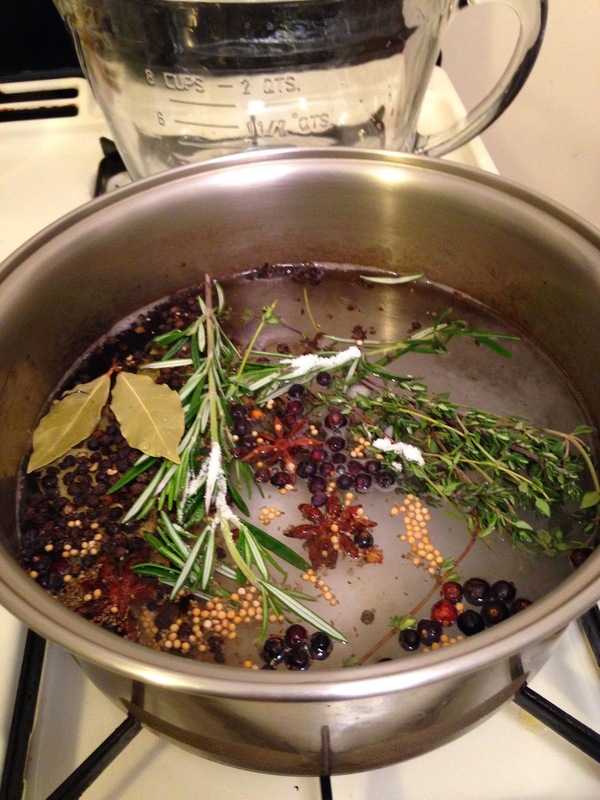 Picked up the whopping 17.75 pounder at Rosemont, got the last of my herbs and sundries at Whole Foods, and had this beautiful fragrant brine. I poured into the bag, no problem there. But then the OCD me, tried to clean out some of the spilled liquid from the cooler, and holding the brine bag, brine, turkey and all, KASPLOOSH! I now had a very fragrant kitchen, as the liquid surrounded my feet, and seeped beneath every nook and cranny of the kitchen, throw rugs and all. So needless to say, I mopped the floor, ran out to restock the ingredients, and came home and started again. Life just never quits with throwing those learning experiences at you. Wash the cranberries and carefully pick out any rotten ones. Strain in a colander. 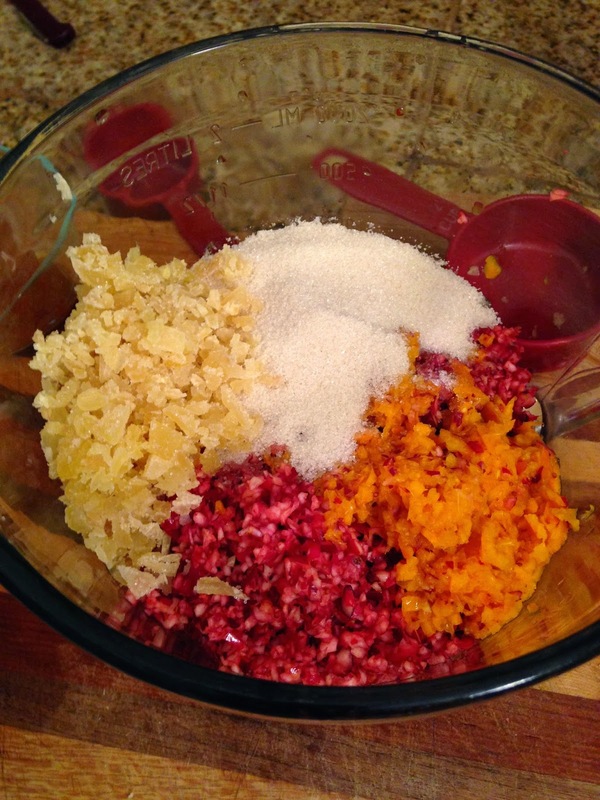 In a food processor, coarsely chop the cranberries using the pulse button. Transfer to a medium mixing bowl. 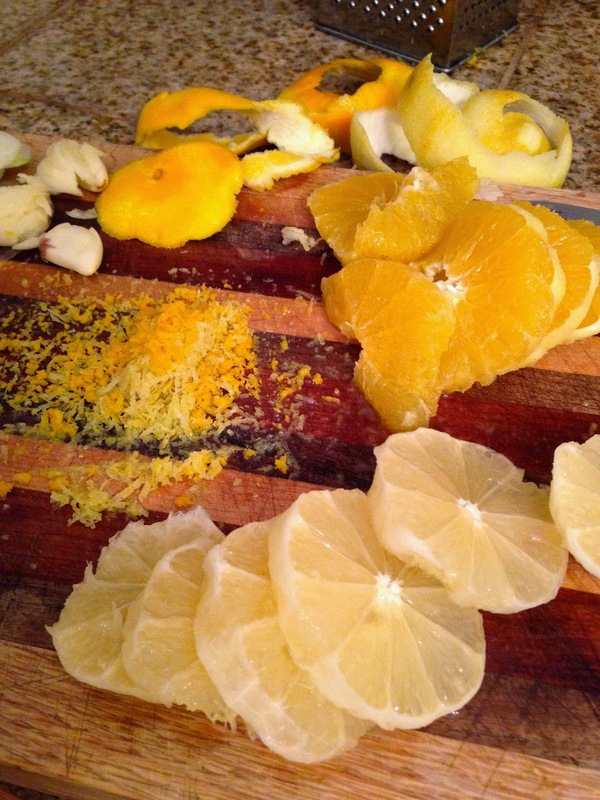 In the food processor, coarsely chop the clementines using the pulse button. Transfer to the mixing bowl. With a sharp knife, chop the crystallized ginger, 1/2 cup worth, and add to the mixing bowl. Add remaining ingredients and stir well. Cover and refrigerate. This can be made up to a week in advance. 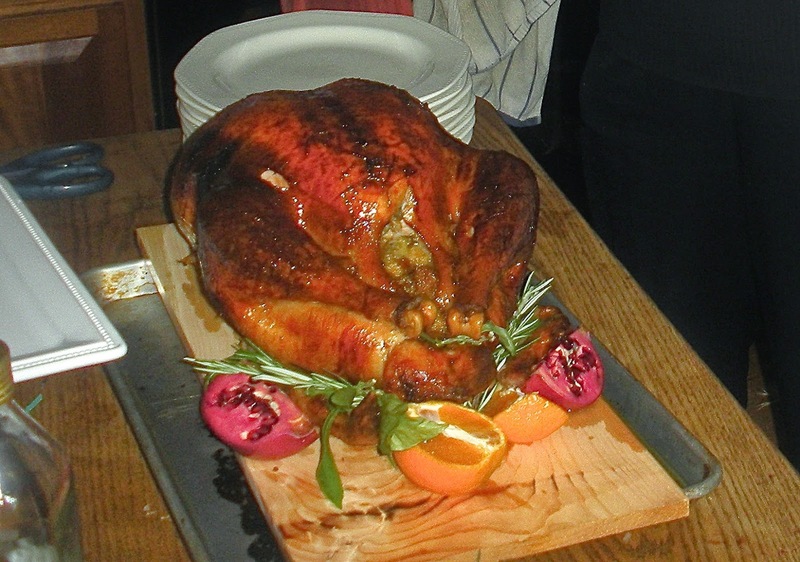 Happy cooking, basting, roasting and baking and have a very happy Thanksgiving everyone! I think the most difficult part of this post, is giving you all the steps before the big day. I don't know about you guys but, I definitely only brine and roast a turkey once a year. In fact it has been two years since this beautiful bird. I will include the recipes I used, and any useful information that I remember. I am sure there were little tweaks I made here and there, and I will not be able to update them, of course until Thanksgiving Day. This will be a two part blog. Part One, will be about the turkey. 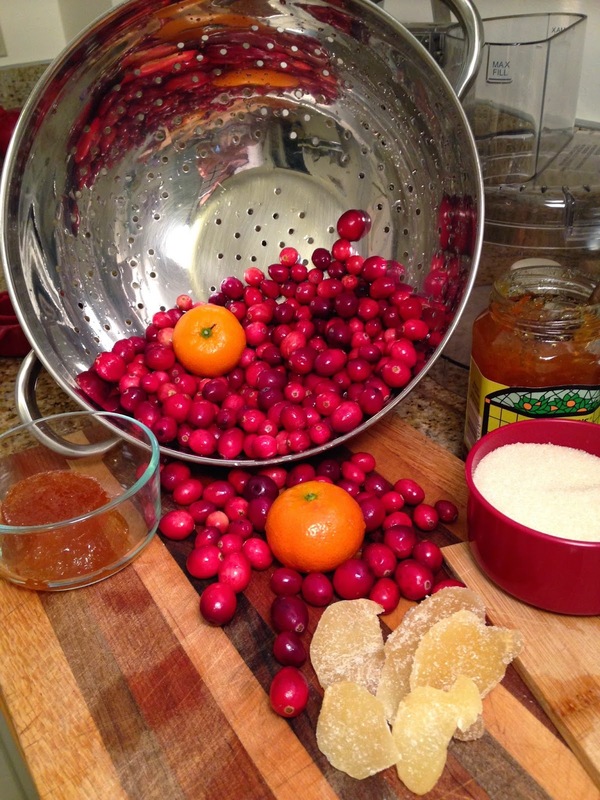 Part two will include the expected story and narration, as well as my favorite and best in the world Cranberry Ginger-Tangerine Relish. It has been pleasing crowds for the past 12 years. In my family we have 4-5 adults and 1 child who eat the turkey. Some of those adults are more modest eaters, and others, well they enjoy the Thanksgiving stuffing and nap on the couch afterwards. I also like to have plenty of leftovers for sandwiches and Turkey Pot Pie. This being said I buy a bird between 12-15 pounds, aiming for the 15. I purchase my turkey through Rosemont Market and Bakery . It isn't cheap, but it is so worth it. I believe the price is $4.99/lb. But again it is worth it. This bird is from Serendipity Acres in North Yarmouth, Maine. It is pasture raised, and basically a happy bird. 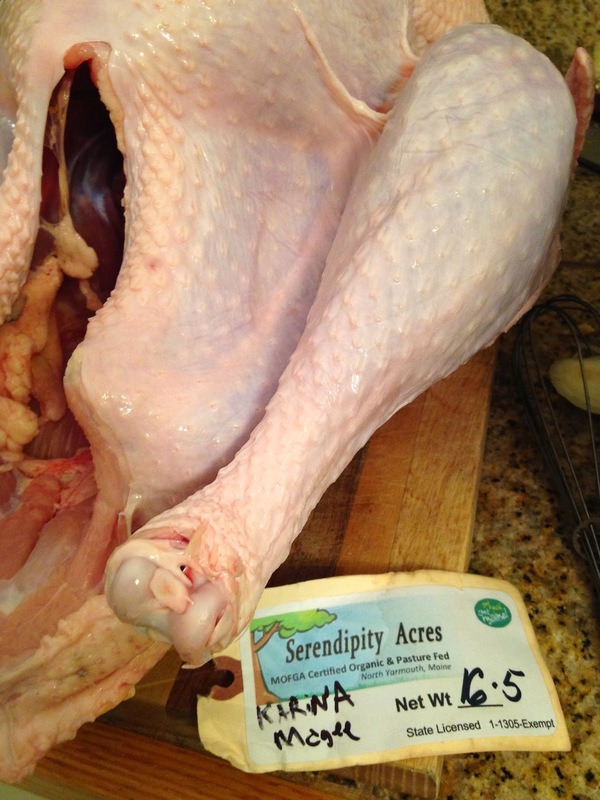 Rosemont offers a cheaper option, from Maine-ly Poultry at .50 less per pound. Last year I bought a bird from Trader Joes and it just wasn't the same. No flavor, and much drier. I swear by the local happy bird. This was a daunting task the first time I brined a bird 3 years ago. I have kind of figured it out now, and don't worry so much about something going wrong, as I did the first year I brined. I think it definitely makes for a more flavorful and moist bird and those who have eaten the turkey since I, the ex-vegetarian (yup, for 15 years) took over, strongly agree. I have to give credit to Martha Stewart for the roasting recipe. 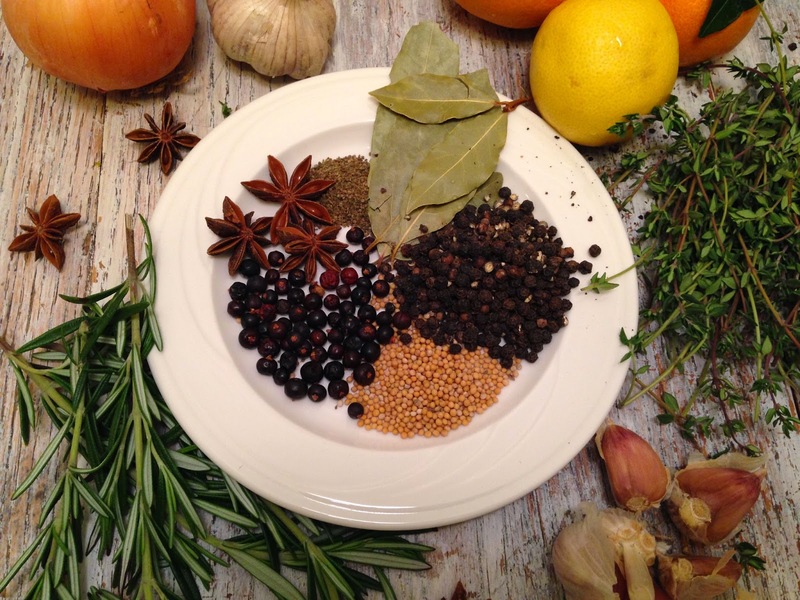 A day before roasting bird, bring 1 quart water, the salt, bay leaves, and spices (garlic, onion, sage, lemon and orange zest and slices do not get added here) to a simmer, stirring until salt has dissolved. 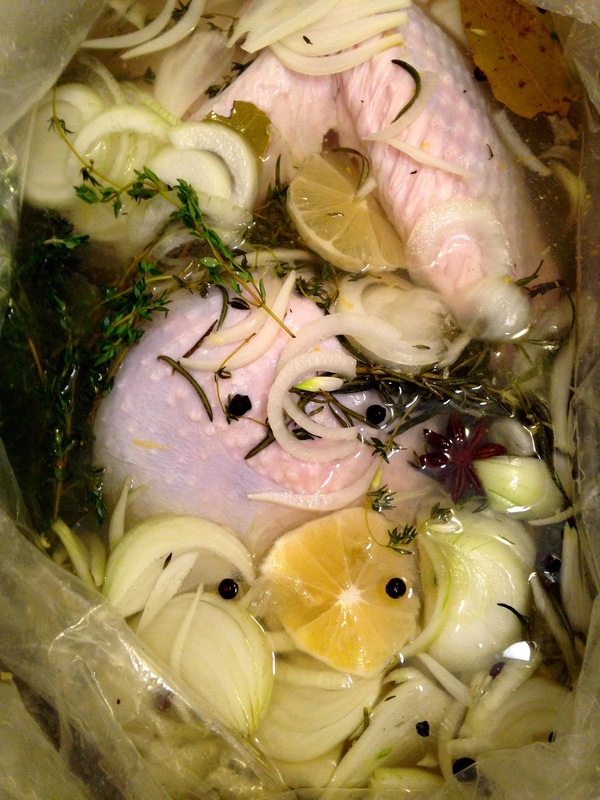 You can Brine the bird for up to 36 hours before roasting. Line a 5-gallon container (or your cooler) with a large brining/ oven-roasting bag. Put the turkey in the bag. Add cooled salt and spice mixture, along with remaining ingredients and 6 quarts water. Tie the bag closed. If turkey is not submerged, weight it with a plate. Refrigerate for 24-32 hours, flipping turkey once. If there isn't room in your refrigerator, place the bagged bird inside a cooler, and surround it with ice, replenishing as necessary to keep it at 40 degrees. 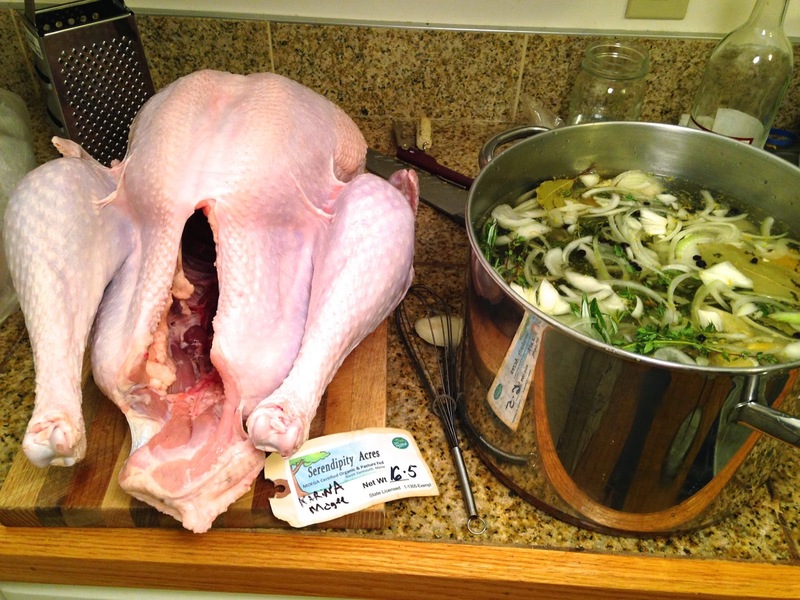 Remove turkey from brine 1 hour before you're ready to roast it. Pat dry inside and out. 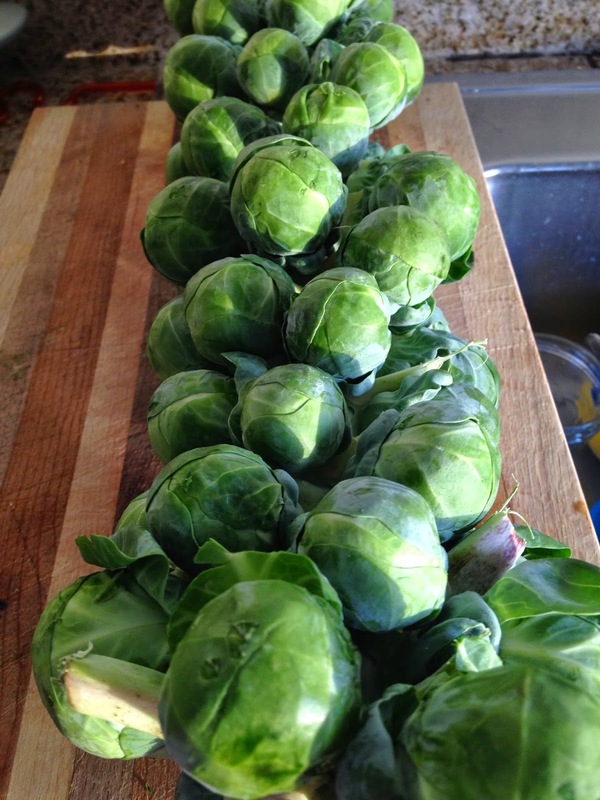 Let stand for up to 1 hour before roasting, it is perfect time to prepare for roasting it. While your turkey is standing for an hour, follow these instructions for making this fabulous turkey. Step 1: Your brined turkey should already be relaxing for an hour. In the mean time, preheat the oven to 425 degrees, placing the oven racks in upper and lower thirds of the oven. Place neck, giblets, carrots, celery, and onion in a heavy-bottomed metal roasting pan. I have used a disposable pan, but it almost always has torn or sprung a leak. Place a roasting rack over the veggies and coat the rack with cooking spray. If you don't have a roasting rack, I have rigged up a cookie cooling wire rack to use. Step 2: Tuck wing tips underneath body of turkey. Tie legs together with kitchen twine. Rub turkey all over with 2 tablespoons butter; season with salt and pepper. Place turkey on rack in pan; roast on bottom oven rack until golden brown, 30 minutes. Reduce heat to 350 degrees. Add 2 cups water to pan; roast until an instant-read thermometer inserted in thickest part of a thigh reads 125 degrees, about 1 hour. Step 3: Meanwhile, in a small saucepan, bring vinegar, brown sugar, and orange juice to a boil over high, stirring occasionally. Reduce heat and simmer, stirring occasionally, until mixture is syrupy, about 10 minutes. Remove from heat and whisk in 2 tablespoons butter and orange zest. Step 4: When thermometer reads 125 degrees, brush turkey with glaze. Rotate pan and roast, brushing turkey with remaining glaze every 15 minutes, until thermometer inserted in the thickest part of a thigh reads 165 degrees, 30 to 45 minutes. It may be slightly longer if using a larger bird. (tent turkey with foil if browning too quickly). Transfer turkey to a platter. Loosely tent with foil and let rest 30 minutes before carving. Letting the bird rest, really allows the juices to distribute and the bones relax, making a juicier more cooperative turkey. Reserve pan with drippings for gravy. Step 1: Separate the carrots, celery, and onions from the liquid. (Those veggies are really tasty). Pour the liquid into a glass measuring cup. Allow the liquid to sit for a few moments so that you may skim off any excess fat. Separate the neck meat from the bone, and include it with the drippings liquid. Step 2: In a jar, mix together flour and water. Shake well and try to eliminate any lumps. Step 3: Poor the drippings into a heavy sauce pan. Slowly add the flour water mixture and whisk constantly to avoid lumps. When the mixture is the desired consistency, remove from heat and sieve if desired. You will be so pleased with this perfectly browned turkey. The skin will be crispy and flavorful, and the meat, juicy and savory. To really jazz up your bird, have some fruit and herbs to garnish it with. I found some tangerines with the leaves still attached, used a pomegranate and some rosemary and sage. Slowly it happens. Each morning, as I begin to stir, slowly stretching out my legs, and peering out through one barely open eye, I notice that the light is changing. It is quite drastically different from that of even the past months. Heavier, with warmer autumn tones, and it just hangs in the canopy of leaves which shade my bedroom windows. And then, I look out one morning and the leaves have begun to fall, the light no longer teases me each morning, as my alarm nags me to extend a leg into the coldness that is beyond my down comfort. I go through a number of emotions, denial, anger, rebellion, but they all lead me to the same conclusion, winter is knocking at the door, creeping in through the unsealed windows, beneath the doorjamb and into my still bronzed skin and my chilled bones. Every morning it reminds me, as I stand there, dumbfounded as to how this is my fifth winter in Maine and still I somehow have nothing to put on to combat this cold, these fifty degree mornings, which inevitably will drop another forty, if not fifty or even sixty degrees before its over. My skin crawls, the stubbles of hair on my legs stand on edge, as if they have experienced a ghost, and they have, the ghost of winter past. Today we turned back the clocks, now not only will darkness enwrap us in the morning when we rise, but it will meld with the charcoal smear of pavement, the road that leads us home at the end of each day. And what better way for mother nature to greet that manmade time shift, but a snowstorm. Yes there is beauty in those flakes, white frozen crystals falling from the sky, contrasted by the fiery yellow maple leaves dancing behind them, but it seems incredulous, taunting us with what's to come. The end of October and beginning of November is a time of death, dormancy, reflection and remembrance. A time when the harvest has been reaped, when the Earth begins to slow down. It is a time when Catholics, Romans, Celts, and Aztec cultures celebrate the link between this world and that which lies beyond the living. Celebrated in many different ways, it is always a time of honoring deceased loved ones and ancestors. I can't help but feel that these practices tied so closely with the Earth's cycles and with the otherworldly have been present in my week, adding a veil of mystery, darkness and uncertainty to each day. from my childhood, all rooted in New England cuisine. The Anadama bread is a delicious, slightly sweet light cornmeal and molasses bread. I used the recipe I got years ago, from my dear friend Mary's mom, Shirley. I've got nothing on her, when it came to my final product today, I have some practice to do. There is nothing like walking into Shirley's farmhouse kitchen and smelling her candy , pies, and breads cooking and permeating the air heated by the antique cookstove in November and December. The Christmas season is usually spent, gorging on her homemade candies and other goodies. The Anadama rolls she makes are just out of this world. That accompanied with a good old bowl of Corn Chowder, warmed my soul and my chilled bones today. In trying to keep this post simple, as my dedication has diminished since returning to work in September, and focused as much on the writing as the recipe, I am just posting a photo of the Anadama Bread recipe. Mine, as you can tell from the pictures, turned out very dense and a little gooey. My failure was, not letting the cornmeal, molasses, butter and water mixture fully cool. I think this killed the yeast and didn't allow the bread to rise. I also substituted 2 cups of whole wheat flour, using 2 cups whole wheat and 2 cups white in total. So enjoy the warmth and comfort of this recipe and please share your stories of the season and any alterations you make to the recipe. Follow recipe on the card below. Cornmeal, molasses, butter, salt, water mixture cooked. Dough getting ready to rise. Final loaf. Again, if you do the yeast correctly, which I forgot about, you will have a much lighter, fluffier loaf of bread or great rolls.